Thousands of grave sites spread out over New Cathedral Cemetery's 125 acres, but the monument to young Daniel and Eleanor O’Donovan is perhaps the most sobering. In their life-size stone likenesses, the children gaze out to the distance. Eleanor stands protectively near her younger brother. For more than a century now, the siblings have been atop a monument with a carved message from their grieving parents, Daniel and Lily: “Sacred to the memory of our dear children.” Childhood mortality was a fact of life and the O’Donovan gravesite makes it achingly real. They died 25 days apart in January 1904. Like the O’Donovans, Irish names are aplenty here. Shamrocks, Celtic crosses, guardian angels and Irish epitaphs adorn many markers. 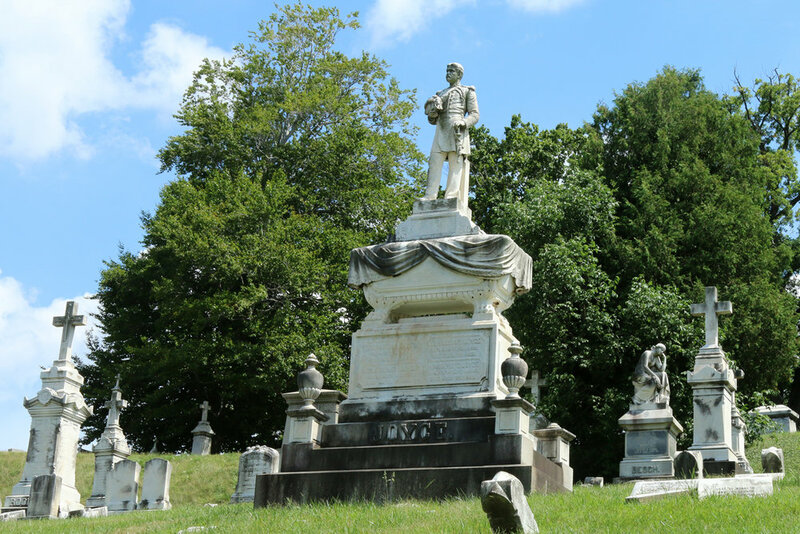 However, the cemetery also memorializes the many ethnicities–French, German and English and African American and more-- who lived in Baltimore during the decades after New Cathedral Cemetery was founded in 1869. Some people still refer to New Cathedral Cemetery as Bonnie Brae (“beautiful hillside”) after the 19th-century estate on which it is located. Gravediggers who depended only on their shovels and backs rued their task of preparing a gravesite in the steep hills. This is the only cemetery operated by the Archdiocese of Baltimore, so its Catholic roots are distinct. Nuns from various orders rest here, marked only by unpretentious limestone crosses. Years after 36 nuns perished while caring for the sick during the city's 1832 cholera epidemic, the mayor of Baltimore donated a memorial dedicated to them. Other religious orders here include the Christian Brothers, The Paulist Fathers and the Xaverian Brothers, some of whom taught at nearby Mt. Saint Joseph’s College. St. Agnes Hospital regularly holds memorial services for babies who have died before birth. New Cathedral Cemetery contains the remains of people who were previously buried in two older Catholic cemeteries: St. Patrick’s Kirkyard (formerly located at Cathedral and Saratoga streets) and Cathedral Cemetery (once located at Fremont Avenue and Whatcoat Street.) Some of the earliest graves found here date as far back as the late 1700s. All of Baltimore’s cemeteries hold notable historical figures. New Cathedral Cemetery has its own distinctive population that includes John Carroll of Homewood; George P. Kane, whose southern sympathies led people to believe that he wouldn't protect President Lincoln as he passed through Baltimore in February 1861; the Francis Scott Key family plot (though Francis himself is buried in Frederick) and an assortment of family and defenders of the famed Surratt family. For baseball fans, it is known as the only place in the country where four baseball Hall of Fame members rest for eternity. Three are of Baltimore Orioles’ fame: Ned Hanlon, Joe Kelley and Wilbert Robinson. The fourth (and the one with the most ostentatious tomb) is John J. McGraw who managed the Orioles for three seasons and then went on to lead the New York Giants for 30 more. In July 1996, beloved Baltimore sportswriter John Steadman wrote a Baltimore Sun article that recounted his visit to all of these gravesites. Soon after Steadman’s own passing in January 2001, he was buried in New Cathedral Cemetery as well. There are also politicians, entrepreneurs and Civil War heroes. Some are little known, but were a part of history, such as Michael Carroll, an unfortunate stone mason who fell during the construction of Baltimore’s Washington Monument. You can also pay respects to one of Baltimore’s most notable personalities, Mary Avara, the controversial head of the Maryland’s now defunct State Board of Censors. Though New Cathedral Cemetery preserves the memories of thousands of Baltimoreans from many walks of life, the surprising view of Baltimore's skyline and the Key Bridge may be the thing that stops visitors in their tracks. The office staff are welcoming to visitors and will give you maps and a list of its most notable people.